UPDATE: I originally posted this in April of 2010, as a tribute to the influence I felt from Barbara Coloroso while writing the book Bystander. In these troubling times, I felt it was time to remember her wise words, which she delivers in 90 seconds. In previous blog entries, I praised this book by Barbara Coloroso . . .
. . . a title that has informed, enlightened, and guided my own work as a writer, coach, and father. She’s awesome, that’s all there is to it. I came across this short video this morning. In less than 90 seconds, Barbara delivers a message that every teacher and parent needs to hear and remember — so that the children in our world hear those same things from us. “You’re listened to, you’re cared for, and you’re very important to me — children need to hear that in lots of different ways every day.” — Barbara Coloroso. I just finished reading your newest book last week. As a middle school library media specialist I now feel that everyone in the school should read this book. I think it is an amazing account of what happens here at school everyday. We are all aware of it and trying our best to change it but things don’t happen overnight. We have been talking about changing the way that we run our summer reading program here at the middle school and have been trying to find an “all school read.” I know that this is the book I would choose. I had a few questions that I thought I might ask. When is this book due out in paperback? Do you have a date or is that something that your publisher decides? If we are trying to fund this program it would be better to know how much to ask for from our donors. Also, I read your blog about school visits, which I agree with completely. We are trying to get the local police and sheriff’s office involved with this reading program and have assemblies before the end of the school year. I do think that it is great for students to sometimes actually meet the author of the books that they have read and enjoyed. We are planning many events around the book and trying to get the community involved. Would you be interested in all in visiting in the fall of this year once school starts? We know the issues of bullying are everywhere but we feel that it is important to make it a priority here in our community. We feel that if we have all the students read your book, discuss it and have their parents, friends and family involved then we can try to make some changes. Please let me know what you think, and THANK YOU for such an amazing book. Believe me, there is no pleasure in having written a topical book such as Bystander. I wish these things weren’t so often in the news or in the lives of our children. But if these heartbreaking recent events are what it takes for people to get focused and motivated, then at least something positive may come from it. In my readings and conversations with educators and experts, I came away convinced that any “solutions” — in quotes — will require the concentrated, enlightened efforts of many people in our schools. Educators, parents, students all pulling on the same oar. 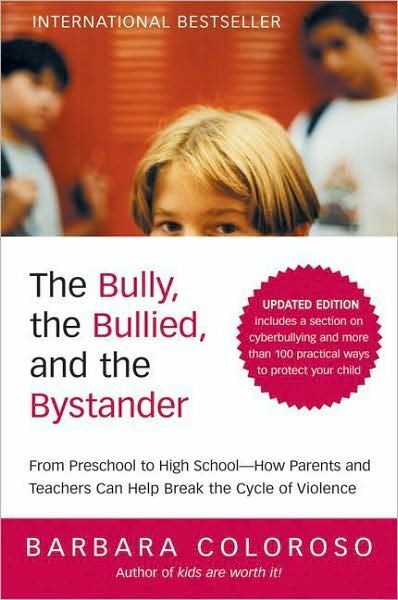 One resource I came back to, again and again, was the Olweus Bullying Prevention Program. I don’t have enough experience to fully weigh one bully-prevention program against another. There are many options available; I can’t say what’s best. I’d guess that each community has its own needs and resources. That said; I was very impressed with everything I read about that program, a view that was shared by many of the educators I interviewed. Written by Barbara Coloroso, this book was an invaluable resource that helped guide and enlighten my thinking. In answer to Ann’s questions: The latest word is that Bystander will be released in paperback in Fall, 2011. I’m told that there will be a Teaching Guide available. Yes, I do school visits. Since I live in the Albany, New York, area, any trips that require serious travel (read: an overnight stay) necessitates more than one day’s worth of visits for such a trip to be possible. What works best is when different schools in a district cooperate and provide 2-4 different full-day school visits. Otherwise, it’s just impossible for me to justify a one-day jaunt to some far-flung locale. Thanks, Ann, for your incredibly kind letter. It sounds to me like you are doing all the right things. Again, it takes a village. You know, there was a point in an early draft of the book when I compared a bully to a terrorist. I pulled that out, fearing it might be a little over-cooked, but I do still think it’s an apt analogy. I believe that bullying, like other forms of terrorism, can never be fully eradicated. These social dynamics will always go on — but that is no excuse for failing to confront them whenever and wherever they occur. What we need is vigilance, increased awareness, and widespread, dedicated cooperation from a variety of sources to help limit the very real dangers. It’s like any criminal behavior: we must police it. 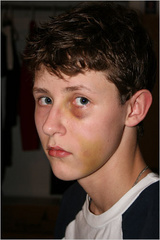 Bullying is not a problem that can be completely “solved” or eliminated. But I do believe we can make real, tangible progress — and one by one, from place to place, positively effect change in the lives of countless young people. That said, my book is a novel, a story, not a recipe for success. My hope has always been that it would be, in addition to a good reading experience, a strong jumping off point for discussion in the classroom. There’s enough clues in there, from the enlightened responses of some teachers in the book, to the mother’s concern and commitment, to the subtle changes in individual characters, to suggest some of the possible responses that are, I think, necessary if we hope to turn things around. I was recently interviewed on this topic at boylit.com. Click here if you’re not sick of me already.